HAD THE LOWER LEVELS of the MV Gem Star remained sealed, as advised three occasions, the vessel would not have been totally destroyed by fire. The is the professional opinion of Keith Garnet Howard, proprietor of Howard’s Marine Limited, who was called in by management of the Gem Star to assist after a fire broke out Monday morning in the lower levels of the vessel which was anchored at the Grenadines Wharf in Kingstown. According to an employee of the motor vessel, the fire was started by welding operations being conducted on the inside of the 150-foot vessel which is owned by Augustine DeRoche. In an interview with SEARCHLIGHT on Thursday, Howard, an engineer who has worked in the marine industry since 1975, said at about 10 am on Monday, he was called by Burt DeRoche, son of Augustine, who told him that the boat was on fire and he needed his help. He said after DeRoche explained the situation to him, he had a clear understanding of what was happening, so he decided to take a 300-pound cylinder of Argonite to the vessel. Argonite is a mixture of Nitrogen and Argon and extinguishes fires by reducing the oxygen content within a room to the point at which a fire can no longer burn, but without compromising the safety of individuals present. Howard said when he went to the Grenadines wharf, he explained to the fire-fighters present what his plans were, but they were hesitant as they did not know what he had in the tanks. “I told them what I was going to do, and they said they had to secure the area. I could not go into the boat, so I told them what to do because they were geared up for that,” said Howard who said he tied a piece of rope to the cylinder after which the fire-fighters took it into the boat. Howard said he told the fire-fighters to hold onto the rope to allow them to make their way back through the smoke and they went into the area where the fire was and released the Argonite. After the Argonite had been released into the room and the doors sealed, Howard said he told the fire fighters to leave the doors closed and he left the area. Fire-fighters along with civilians trying to put out the fire onboarrd the MV Gem Star on Monday morning at the Grenadines wharf. “The smoke had subsided and only white smoke was coming out which means basically that is water vapour coming out at that time, so I know the fire was under control then and I said don’t go in for now, leave it a while,” Howard explained while adding at that point he did not tell them how long to leave the area sealed. Shortly after he left, Howard said he received a call asking him to bring another cylinder of Argonite as the fire had reignited. Perplexed as to why this was happening, he said when he inquired of DeRoche what had happened, he was told that the room had been reopened by the fire-fighters. “So I said okay, no problem and I went and took two more bottles of Argonite,” Howard related. He added that he had also told them to seal the vents leading to the where the fire was and that was done, but when he went back the second time, he observed that two of the vents had been unsealed. “I said ‘why they open the vents?’ and one the police officers say ‘oh we hadda open it to get the smoke come out so we could go in’ and I say ‘lord of mercy’,” Howard told SEARCHLIGHT. He said he is not an argumentative person, so he said okay and resealed the vents after which he told them to release the two cylinders of Argonite into the affected areas once again and leave the doors sealed. “After a while, things simmer down and there was no smoke. The deck was hot, so I told them to wet the deck because if you cool the boat and get rid of the fire downstairs it will simmer down slowly,” Howard said. He left again, but on Monday night he went back and observed that smoke was once again billowing from the boat and when he inquired, he was told the room had been reopened a second time. Howard said he realized that he would need more Argonite so he contacted Cable & Wireless who gave him four cylinders as his supply had been exhausted. He said he told the fire-fighters to go into the vessel and give him a report of what was happening in the vessel including the colour of the flames. “They went in … [and said they saw] some flames and water on the ground boiling, so I put in two more cylinders and told them to reseal the boat and everything subsided again,” said Howard. 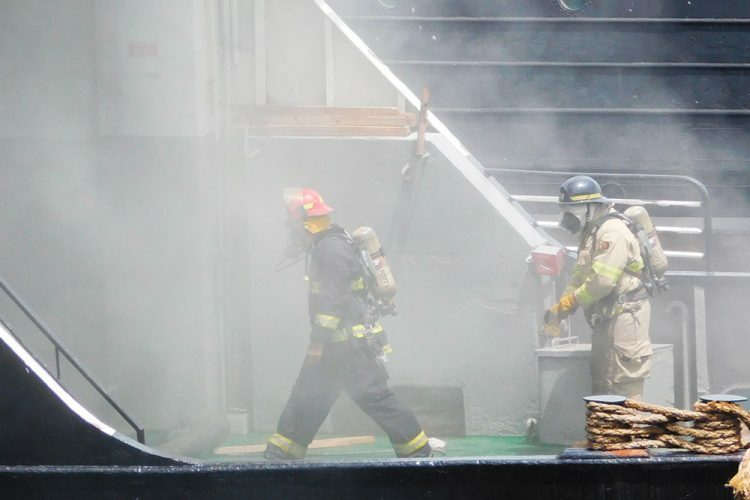 The deck and the sides of the boat were sprayed with water and Howard said that after midnight Monday, everything seemed fine and the next morning the deck was still hot, but cooling, and that showed the fire was subsiding. “But Tuesday afternoon I got a call from Burt and he said the boat burning again and I said ‘what stupidness you talking how the boat go be burning?’ so I had two more cylinders, so I told someone to take the cylinders, but when I got there they were pulling the boat from the wharf,” said Howard. He said they could not get to the boat and the way the boat was smoking, he knew someone had reopened the doors a third time. “Firefighting training, we have to do that,” said Howard who revealed that he has done firefighting training over the years because of his work with boats and he was recently certified with Jaric St. Vincent Limited, a Trinidad based company that specializes in among other things, simulated firefighting. “If the boat can sit there overnight from 10 in the night to 8 the next morning and nothing happen and there was fire inside, it tells you the fire was subsiding,” said Howard. “The fire department did what they could do, but it is just unfortunate…,” Howard said while adding that the doors should never have been reopened and if he had had his own crew, he would have fought the fire differently. He added that the crew of the Gem Star wanted the police to give them the gear to go into the boat and fight the fire, but the police could not do that. “The police, I don’t think they are trained with that type of fire…. “You can’t blame anybody… my thing is that the training is important, and we have other areas that should have been able to give more assistance in this. The Port Authority should have trained fire fighters…the whole thing needs revamping, St Vincent is our country,” said Howard. In a call to Hot 97.1 on Wednesday morning Burt DeRoche said Howard and his uncle Peter Ollivierre had told fire-fighters not to reopen the doors that had been sealed. “…Like the firemen and them they get fed up and they went and open the door and wet down the boat and the fire start to blaze up… “They went and open the door and that was it. That was the end of the boat,” DeRoche said. at the wharf overnight on Tuesday, as a cruise ship was expected on Wednesday morning. “I think they could have just hook up the boat and take it to Ottley Hall, but the fireman and them get so vex … and get on because they want the boat move from the dock, which I understand because of the cruise ship,” DeRoche told listeners. On Tuesday evening, the boat was towed to a point off the reclamation site in Kingstown where it was anchored and left to burn. Reports are that the heat melted the anchor chain and the boat drifted out to sea. It was towed up the Leeward coast to as far north as Layou where it eventually burnt out, after which it was towed south to the Ottley Hall Shipyard and Marina. Commissioner of Police (COP) Colin John said on Thursday that he was awaiting a report from the fire chief, so he did not want to comment before the report was available to him. of Grenadines Affairs told SEARCHLIGHT that the destruction of the boat is going to significantly impact movement of people and cargo to and from the Grenadines. “This is the boat that carries aggregate and things of that nature and this is seriously going to affect the construction industry and every project that we have in the Grenadines. 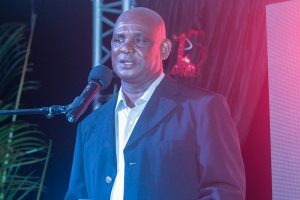 The absence of a vessel like Gem Star — we have the Easter festival coming up but… it’s going to interfere with everyday life despite the festivities that we may have,” Snagg said. He added that Gem Star has been the boat handling the bulk of the transportation processes for the Southern Grenadines over the past two years, since MV Barracuda had been out of commission for some time. 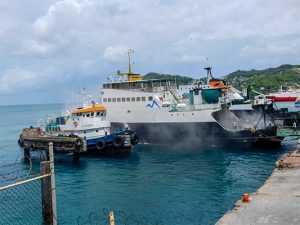 On Wednesday, it was announced that the MV Bequia Express III would sail to the Southern Grenadines today Friday, April 12 at 1:30 am and return from Union Island at 4 pm. Updates about next week’s schedule were promised.